Members of National Youth Service Corps (NYSC) on Monday decried poor state of facilities at the permanent orientation camp Kaduna. 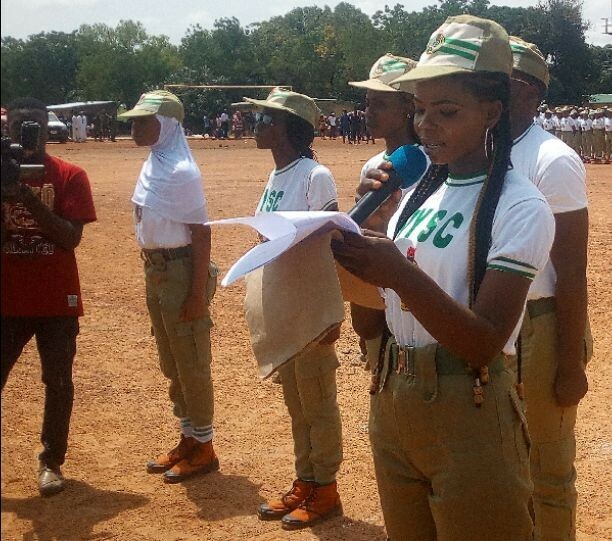 The corps members in a letter sent to the governor and read before the guests at the closing ceremony of 2018 batch ‘B’ (Stream II) joint orientation course for corps members deployed to Kaduna and Niger States, revealed their dissatisfaction about the state of the facility at the camp. The letter, which was signed by leaders of the 10 platoons but read by their representative, Ejokobo Loveth Avurakoghina added that, what their predecessors had told them was different from what they experienced on camp within 21 days of their sojourn at the camp. The letter read in part, “our expectation as to what a camp environment should look like is not what we met when we came into Kaduna State camp. “The multiple purpose hall is too congested to accommodate the large numbers of Corp members always dispatch to Kaduna camp which is exposing us to sun during lectures and social activities. “More accommodation facilities are obviously required and the existing ones are nearly inhabitable due to the dilapidating state of the most of the existing structures. In an interview with newsmen shortly after declaring the orientation closed, Governor El-Rufai, who was represented by Commissioner, Ministry of Youth, Sports and Culture, Daniel Dan-Auta promised to deliver the corps members’ letter to the governor whom he believed will act on it. El-Rufai also restated the commitment of the state government to build more hostel blocks to accommodate the full complement of corps members expected to be deployed to the state. Earlier, Coordinator of the scheme in Kaduna, Hajiya Walida Siddique Isa hammered on the issue of inadequate accommodation which has limited the number of corps members currently being deployed to the state. According to her, the state can only accommodate maximum of 2,600 corps members as against its capability of absorbing more than 5,000 corps members per batch. She further highlighted that, the more corps members deployed to the state, the more corps professionals like teachers, doctors and engineers among others, deployed to serve in the state. “The Governor sir, considering the important position of Kaduna in Northern Nigeria, the inadequate accommodation has limited the number of corps members deployed to the state which is capable of absorbing over 5,000. “I therefore appeal to you to construct additional hostels to accommodate the expected increase in the number if corps members deployed to the state for service”, she said. Reacting, Chairman, Kaduna South Local Government, Kabiru Yakubu said, though the corps members have made their observation known to the state government, the available resources have a lot to do with project execution. “I belief very strongly that, as a lover if youth, the state government under Malam El-Rufai will respond to the letter by corps members. But then, we have one of the best camps in Nigeria though there is always opportunity for improvement which the state government will do”, he added. Meanwhile, an educationist, Adamu Jalil opined that, there is the need to overhaul facilities in all NYSC camps across the country to enable the system cope with the level of sophistication the world is currently undergoing so young Nigerians that will be passing through the scheme for a year can have proper orientation of self employed and job creators.